Ive been gaming all my life, Since 91, on such classics like Super Mario/Duck Hunt/Clu Clu Land, and Blades of Steal. 94 I got a Sega Genesis, with Sonic Battletoads and Shinobi. Wasnt till 97 till I got my N64, DK and Mario 64. In 2000 got a PS2, and FFX, which I put over 1000 hours playing it loved that games. Moved out, and on, Moved out with a good friend and a OG Xbox, My Life was changed forever! Forza Motosport, Beyond Good and Evil, and Prince of Persia. My First X360, Forza Motosport 2, NHL 07, and what was known as my life is over. 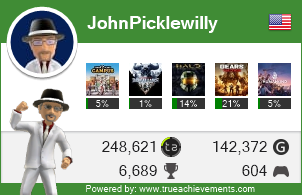 I played casually until I went to basic, after basic I became a completionist, Oblivion and Forza Motorsport 2. Dude, maybe you should attend a twelve step meeting, eh? Just curious, how many of these games are digital?